This Event has been read: 523 times. "Mr. Alexander: Try the wine!" We host a lot of “Once in a Lifetime” wine tasting events with red wines but we don’t give enough attention to the world’s great whites. 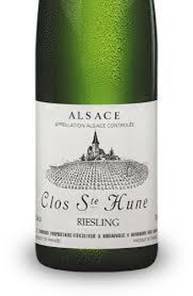 This tasting will feature one of the rarest of all the world’s great white wines, Alsace’s ultimate cult white- Trimbach’s Riesling Clos St Hune. Clos Sainte Hune is a 1,67 hectares exceptional stony argilo-calcaire, or Muschelkalk, limestone terroir, exclusively planted to Riesling, located in the heart of Grand Cru Rosacker, in Hunawihr. The calcary soil allows this Riesling to develop a specific aroma and a wonderful concentration of fruits. Dry yet succulent, of phenomenal complexity, this wine develops an extraordinary aftertaste of minerals after a few years in bottle. The plot, which is approximately 50 to 70 years old, is south south east exposed and the yields are low. Annual production reaches about 9000 bottles, depending on the vintage. That makes the wine so unique that Clos Sainte Hune is looked for by many collectors all over the world. The grapes are picked as late as possible in order to achieve maximum ripeness which, in turn, gives optimum depth of flavor and complexity. The grapes are picked by hand and pressed gently in a pneumatic press. The juice runs into the cellar by gravity and clarifies naturally prior fermentation. The juice ferment in stainless steel at controlled temperature for 3 or 4 weeks. The wine is vinified to complete dryness. No oak ageing, because it is believed that oak does not bring anything to the wines of Clos Sainte Hune, except hiding the fruits, the flowers and moreover the salient characteristics of which are extreme purity and concentrated fruits. Bottling is early to preserve freshness. Wines are bottle-aged for several years before leaving the winery, especially CSH, for minimum 6 years. Of great longevity and very rare, Clos Sainte Hune takes at least seven or eight years to reach its peak. 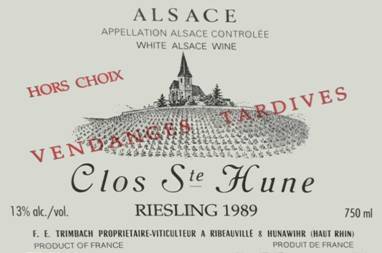 Wine ageing: 10-20 years + and tonight we have 20+ year old examples of the Clos Sainte Hune along with the incredible rare Riesling Clos Sainte Hune Vendange Tardive. This rare late harvest treat has only been produced two time since the first vintage of CSH in 1979. The fee for this “Once in a Lifetime” tasting which includes dinner is $295 + tax for reservations call 954-523-9463 or e-mail andy@winewatch.com. The crop was exceptional. Normal size yield. Winter was not so cold and rainy. May was rainy, then flowering was hot and dry, and they from July to end of August, it was dry. Harvests from 6 to 27th of October (and then from 21st to 24th of November). 1990 was a GREAT harvest and a wonderful vintage for Riesling. All the growing season was perfect during this vintage, the grapes were fully ripe and also very healthy. Clean, healthy, ripe grapes with absolutely no touch of rot at all, it has a very clean and precise flavour. Full bodied with great richness and layers of fruits. Very good vintage. Especially good for Riesling. Good vintage, a lot of VT and SGN wines. High sugar levels. Good vintage. Hail storm on the 5th of August. Already sold out, released before 02′ because of the hot summer. Alcohol: 13,2% Residual Sugar: 5 g/l Total Acidity: 6,5 g/l Quite flattering. Only made in two vintages this is the holy grail of Vendage Tardive from Alsace! The fee for this tasting which includes dinner is $295 + tax for reservations call 954-523-9463 or e-mail andy@winewatch.com. Please let us know when you make your reservations if you don’t do Flambee (it has bacon in it). The viticultural origin of the Trimbach Family dates back to 1626, when Jean Trimbach, who had come from Sainte Marie aux Mines, was recognized as a citizen of Riquewihr. From then on, the Trimbachs became renowned for their wine-growing. Jean-Jacques Trimbach, born in Riquewihr on the 6th February 1633, and later his son Jean, born on the 18th March 1677, were successively mayor of the little village. The next Jean-Jacques Trimbach, born in 1750, decided to become a master cooper - an activity which fitted in admirably with the viticultural vocation of the Family. The Family tree continues with Jean-Louis Trimbach, born on the 12th of May 1783, whose son Jean-Frédéric, born on the 18th of June 1811 took an important position in what used to be called the wine « gourmetage » in the village of Hunawihr, well known for its excellent wines and especially for its Riesling. The transfer of his activities to Hunawihr dates back to the 1840's. He was the mayor of the village for many years. His oldest son, Frédéric Emile, born in Riquewihr on the 20th of December 1839, stepped into his shoes in Hunawihr. Frédéric Emile really developed the business on the lines of the present House of Trimbach. 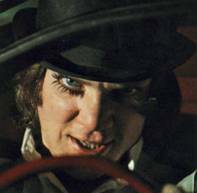 He gave the firm his two initials « F.E » which have been kept ever since. The highest quality certificate given to Mr F.E. Trimbach for his wines at the international show of Brussels in 1898 testifies to their already established prestige. To extend the business his son Frédéric Théodore, born in Hunawihr on the 5th of November 1875, transferred the Trimbach firm to the medieval town of Ribeauvillé soon after World War I. He was one of the founders of the wine-growers and merchants' Association and one of the first promoters of Alsatian wine. As an outstanding taster, his judgment was sought after in the whole Alsatian wine growing area. For almost four centuries, the Trimbach Family has been promoting Alsace and its History, its exceptional terroirs and fine wines. 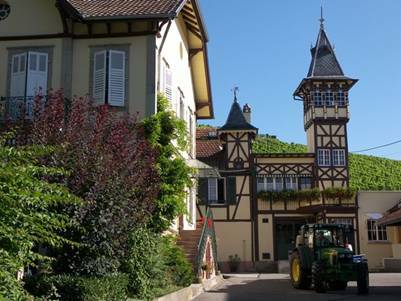 Maison Trimbach is still located in Ribeauvillé and still owned by the two grandsons of Frédéric Théodore, Bernard and Hubert, since their father's untimely death in 1945. Pierre and Jean, Bernard's sons, the 12th generation, have joined the Firm in 1979 for Pierre and 1985 for Jean to work on the vinification for the first one and on the promotion of the wines for the second one. Anne, the eldest of the 13th generation, has just joined the Family Business.